It's time for you to really step it up, Cash. It was reported this morning that Brian Cashman is interested in acquiring Mike Moustakas. The 2018 New York Yankees are special. Never before, in my 40 years on this Earth, have I felt this way about the Bombers. Perhaps it has to do with the Wild Card one-and-done playoff game. Or maybe it's the lackluster starting rotation. I suppose it could be the team has gotten little production from their catchers and first baseman. It probably has to do with them having the second-best record in Major League Baseball, while the team with the best record is in the same damn division. Who am I kidding? It's all of those things! As awesome as this team is they can be better. And seeing how the Red Sox and Astros have been playing they probably need to get better. I get so angry just thinking about this team being relegated to the Wild Card game, and losing due to a sub-par showing. Which absolutely can happen. The Seattle Mariners, as of right now, would be the second Wild-Card team and that lineup of theirs can do some real damage. 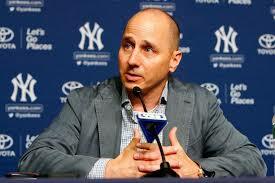 But when Brian Cashman has so much firepower at his disposal, something must be done to improve. The farm system is loaded, while almost all of them are blocked at the big league level. Along with plenty of room under the Luxury Tax threshold, the Yankees can get whatever player they want. I'd love to give Greg Bird a little more time to see if he can get settled and hit like so many people think he can, but if options to upgrade at first base start to dwindle then make a move. Avoid having a hole in the lineup for guys like Verlander, Sale, and Bauer to exploit. I would say the same for the catching spot, but I just don't believe that Gary Sanchez is going to go from a great hitter one year to a below average one the next. That's the one sore area that I'm cool sticking with. Oh, and that starting rotation... it's the shits. You have Luis Severino (214 ERA+), CC Sabathia (140 ERA+), and everyone else (below average, except Loaisiga who I just don't trust to start a big game). How can you possibly stick with that? Especially when the Red Sox have Chris Sale (181 ERA+), Rick Porcello (122 ERA+), and Eduardo Rodriguez (113 ERA+). Or the Astros have Justin Verlander (176 ERA+), Charlie Morton (148 ERA+), and Gerrit Cole (140 ERA+). And the Indians have Trevor Bauer (179 ERA+), Corey Kluber (166 ERA+), and Mike Clevinger (141 ERA+). That rotation is absolutely unacceptable. And for the record, JA Happ would be nice, but if that's the team's "big" acquisition I'm not going to be blown away at all. Happ just got shelled by the Tigers (he gave up 7 runs, on 10 hits, in 5.2 innings), and since pitching gems against the Red Sox and Rangers on April 24th and 29th, the only times he's looked really good were against the Mets and Orioles (you could look good against those lineups). Who cares if it's the cross-town Mets that get to enjoy Clint Frazier, or whatever other young future stars? At least they are in the National League, and the Yankees would only have to worry about facing those players a handful of times a year during interleague play (I don't seem them being World Series contenders for a while). So do whatever it takes to get deGrom. Doesn't that rotation look sick? Plus, Tanaka is not that far away from the pitcher we saw 2016. He simply needs to walk fewer batters and keep the ball in the park more often. That may be easier said than done, but the point is it's certainly possible. And Sonny Gray is not done for, either. I really think he has to go back to what worked for him so well in Oakland and use the fastball more often. It's not like his velocity has dropped, and he needs to figure out another way to be effective (like Sabathia did). Again... this 2018 Yankees team is special, and they have a chance to be so much better. And if Brian Cashman doesn't get it done, then in this writer's opinion, he's very much tarnished his legacy. Don't let us down, Cash.